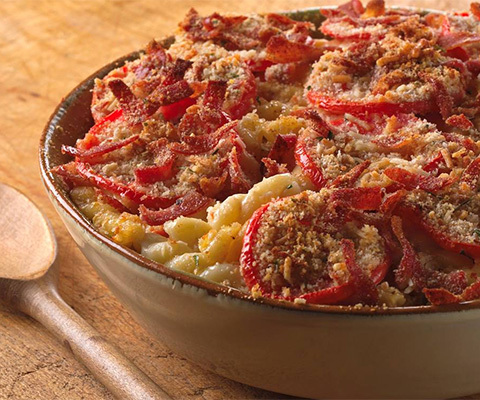 This hearty dish has a rich cheese flavor and an outstanding crispy texture on top. Serve as a main course or a side dish. Preheat oven to 400°F. Cook pasta al dente according to package instructions and drain. Lightly coat 13x9 baking dish with nonstick cooking spray. In a large bowl, mix together Pasta Sauce, Fontinella, Asiago, 1/2 cup of Parmesan cheese and cooked pasta. Transfer to baking dish and spread evenly. Arrange the tomato slices on top. In a small bowl, mix together the remaining 1/4 cup of Parmesan, breadcrumbs and prosciutto. Sprinkle on top of tomatoes. Bake uncovered for 30 to 40 minutes, or until top is golden brown. Allow to rest for 5 minutes before serving. If desired, substitute Fontinella cheese with sharp white cheddar cheese. If desired, substitute Classico Roasted Red Pepper Alfredo Pasta Sauce with Classico Creamy Alfredo Pasta Sauce.